This Ferrari 225 Sport with Berlinetta coachwork by Vignale will go up for auction May 1st, 2010 at RM's 'Sporting Classics of Monaco'. In case this car is beyond your reach, we've uploaded ten wallpapers in our Gallery to provide a little bit of comfort. The car in particular is Chassis 0170ET, probably best known for being the '52 Italian Hill climb Championship class winner. Read #0170ET's history at Barchetta.cc. 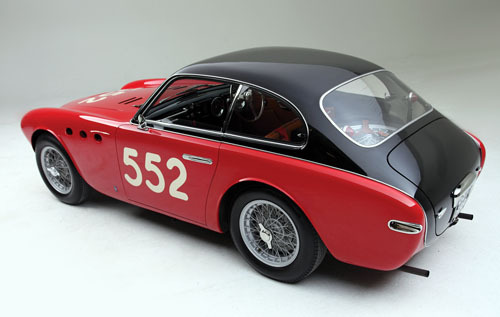 For RM's 'Sporting Classics of Monaco' the Vignale Ferrari is estimated to sell for about $600,000.- to $800,000.-. We'll see what happens. However, the wallpapers are free! The wonderful studio shots were made by 'Derdehmel Fotografie', of which the first ten in the Gallery are scaled to 1280x1024 to fit most desktops. The images first open in 670 pixels wide. Click on a picture again to have it enlarged. UPDATE: We've also added the slightly different looking sister car #0168ED to the Gallery. The first period picture and all the colored studio shots are sized 1600x1200 pixels. Go check it out!